The Do’s and Don’ts PowerPoint Template is a presentation tool for comparison topics. It is a data table design with thumbs up and down icons. 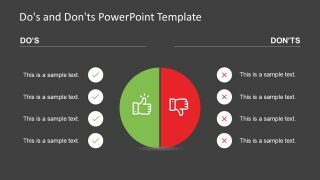 There are four slides of do’s and don’ts displaying a different number of rows in each. 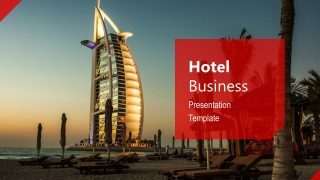 The last slide; however, contain black background which can help users to select a template according to their presentation theme. These do’s and don’ts slides show two contents layouts with circular clipart icon in the middle. This icon shows two halves of a circle with thumbs up and down icons. Further, thumbs up is a green half circle shape while thumbs down is red. These two colors are commonly used for right/wrong, true/false, yes/no etc. The Do’s and Don’ts PowerPoint Template provide four, five, and six rows layouts. 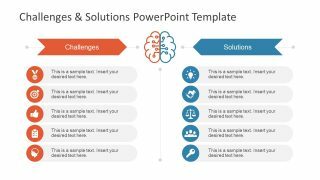 These slides, at professional level, assist in comparing products, services or solutions. The two segments process can also demonstrate current and future state of an entity. It could be a company, its services or process approach. Or, explain pros and cons of a process as a brainstorming activity among peers. But more importantly, these slides enable audience to understand which action should or shouldn’t be taken during project. The correction symbol “green tick” represents do’s as bullet points while “red cross” is for don’ts. 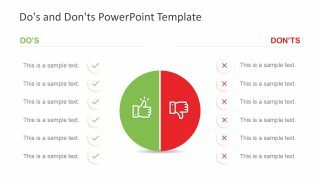 The do’s and don’ts template is a fully editable and customizable PowerPoint. Therefore, users can make changes in colors of background, shapes, icons, and text by using formatting options. And, they can edit text placeholders by adding important presentation content. 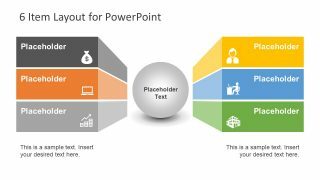 They can also replace circular bullet point and half circle shapes with any other figure available in PowerPoint. 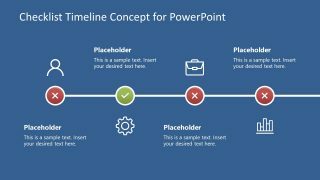 These feature of changing flat shapes or colors enables users to adjust new slide into their existing presentation’s theme.